You can extend your support for Moo Do values in many different ways including charitable, tax-deductible donations. 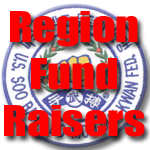 The Federation and the FOUNDATION provide multiple means for supportive members to contribute including, but not limited to, active participation in regional and national events, product purchases, subscription services, direct non-taxable donations and charitable tax-deductible donations to the FOUNDATION. Please take a moment right now while its on your mind and make your personal pledge online or via any of the means listed below. The National Federation publishes information about National events as it becomes available and about Regional events when Regional Officials provide information to Headquarters for national publication. However, not all Regional information passes through Headquarters and in those cases you may be able to locate information you are seeking on Regional websites, Regional Facebook pages, etc.